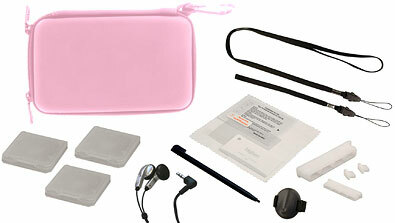 Accessories : Safety Accessory Pack for DS Lite, pink - SHOP01MEDIA - console accessories and mods, retro, shop - One Stop Shop! Protective case for NDS Lite, cases for carts, screen protectors, headphones, stylus pen, etcProtective case for NDS Lite, cases for carts, screen protectors, headphones, stylus pen, etc- Screen protectors : protective films for console screens. - Tactile thumb : ring with builtin tactile sensor, to be worn on thumb. - Storage cases : storage and protective cases for your NINTENDO DS™ games. - 4 protectors for console connections providing a perfect finish. - Adjustable wrist strap and neck strap for the console and its pouch.